Note that I define process (noun) as explicitly-defined coordination of services and/or activities to produce a particular result (see http://improving-bpm-systems.blogspot.com/2013/03/bizarch-artefacts-definition-again.html for more details). Thus the process is not only a predefined order of activities which is repeated many types. There are other variations of process as shown in see http://improving-bpm-systems.blogspot.com/2010/12/illustrations-for-bpm-acm-case.html . For example, buying any car requires some planning, visiting car dealers, taking a credit, etc. - a normal process which is unique in each case, but is constructed from some, mainly decision, process patterns (I must write a blogpost about those decision patterns). Customer-experience-as-a-process - a person who is buying a car acts as a customer for a car dealer. This is a normal selection, trying and negotiation process among two roles. Each role has its own process (or own BPMN pool) and both processes are working together as co-processes. An excellent example http://www.slideshare.net/Olbrich/process-experience-the-coffee-example-2103831 shows what is important to measure in such case. If your products and services fit better into those processes (i.e. reduce the hassle for a customer) then they will be more attractive for customers. Potentially, all four mentioned above processes should be taken into account to improve the customer experience. Then the customer will consider your service again. IMPORTANT: Ask right questions. For example, a civil architect will ask a customer "Do your parents visit?" "How many kids do you want?" "How long do you want to stay in this place?" and then the architect works with the customer to find the best design that meets the customer needs. Product-as-a-process (it has the life-cycle) and service-as-a-process are designed, delivered and evolved to fit those four mentioned above processes. Business-as-a-process or enterprise-as-a-process are taking care to organizing the that design, delivery and evolution. Unit-of-work-as-a-process is a typical decomposition of "normal" business processes. 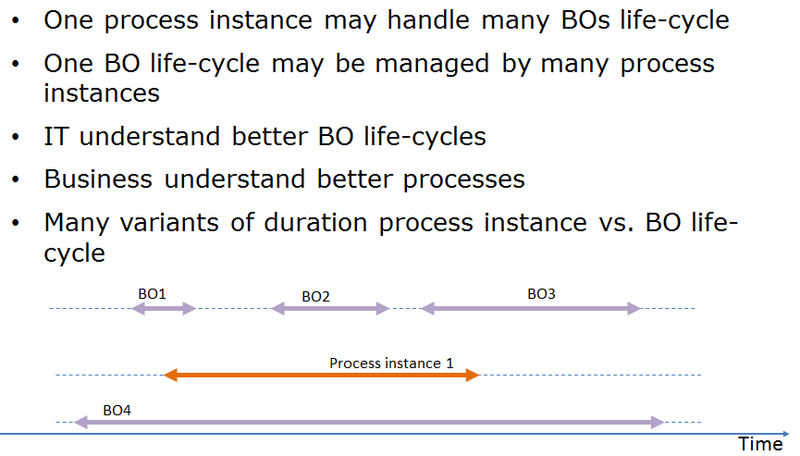 Resource-as-a-process - each resource has its own life-cycle; for example a document or business object (BO) as shown below (slide #15 from http://improving-bpm-systems.blogspot.com/2013/04/addressing-security-concerns-through-bpm.html). Processes must be made explicit and executable to employ the power of processes. An enterprise can do this with its own processes. Person's and customer's processes are still implicit (although they may use some explicit process patterns). Nevertheless, an enterprise should anticipate and maybe model those implicit processes to see how enterprise internal processes fit those external processes (sounds like some variations from http://improving-bpm-systems.blogspot.com/2010/12/illustrations-for-bpm-acm-case.html maybe useful).